Observation - miked's 283rd spot submitted on 29th September 2009 - UK and Ireland. 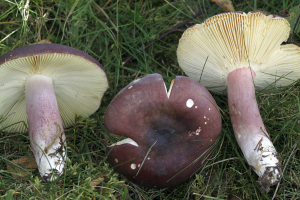 Description: Most Russulas are very tricky to identify but hopefully this one with its very nice dark pink/purple cap and stem and almost primrose coloured gills is distinctive enough to be sure. It was growing with birch, juniper and with scots pine not far away. Most Russulas are very tricky to identify but hopefully this one with its very nice dark pink/purple cap and stem and almost primrose coloured gills is distinctive enough to be sure. It was growing with birch, juniper and with scots pine not far away.